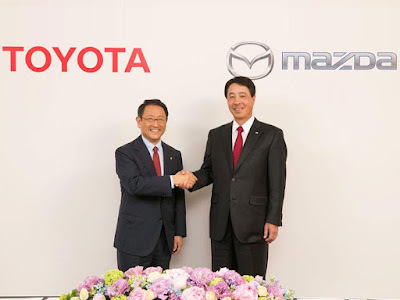 Some time ago, Toyota and Mazda announced a partnership between them and are now beginning to move and the early stages of building a joint factory. Toyota and Mazda agreed to start building joint factories in the Alabama or North Carolina region. Both regions have defeated candidate locations for other plant construction such as Tennessee, Texas and South Carolina. Unfortunately Toyota and Mazda refused to answer related to the construction of the plant. Corolla while Mazda calls the plant to produce SUVs. Toyota is the owner of Daihatsu and then often bring twin cars like Avanza-Xenia, Agya-Ayla, Rush-Terios and the latest is Calya-Sigra.The cars also managed to get their own place in the people of Indonesia. Avanza-Xenia for example, managed to become the highest selling MPV sales in Indonesia. Similarly Calya-Sigra is the pioneer of three lines LCGC.Rush-Terios himself was rumored to be present his new generation. Unfortunately until now both APM is still reluctant to respond to the issue.